Hi all! It’s been a while hasn’t it? I’ve been trying to enjoy the last summer days before my kids go back to school. Although I haven’t been blogging I’ve definitely been cooking and I’ve got some great new recipes to share with you starting with this one. While some plants didn’t do so well in my garden, I’ve got an over abundance of kale, swiss chard, and soon I’ll be harvesting lots of cabbage. So I’ve been looking for ways to cook up all these vegetables and I’ll soon be sharing more garden to table recipes with you. 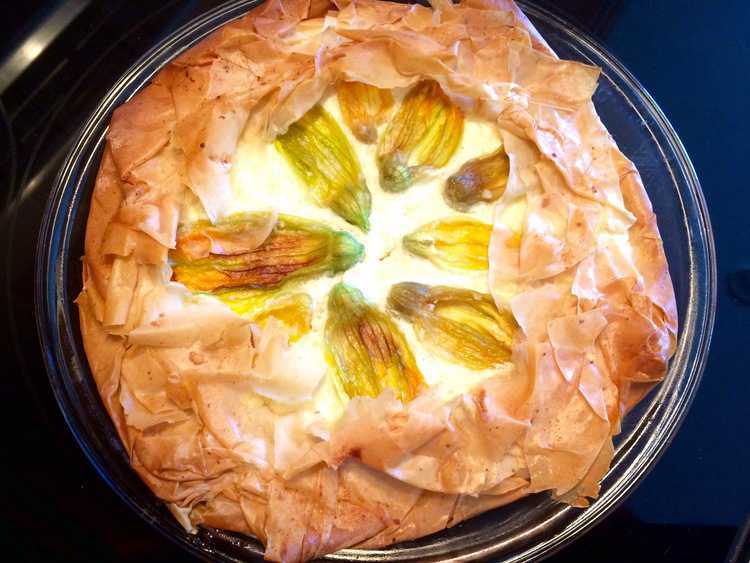 Let’s begin with this Zucchini Blossom and Ricotta Filo Tart. Unfortunately my zucchini plants have not produced many zucchini so far, I’ve picked only three all summer. However, the zucchini blossoms have been endless since mid-July and my mother has been providing me with hers as well. 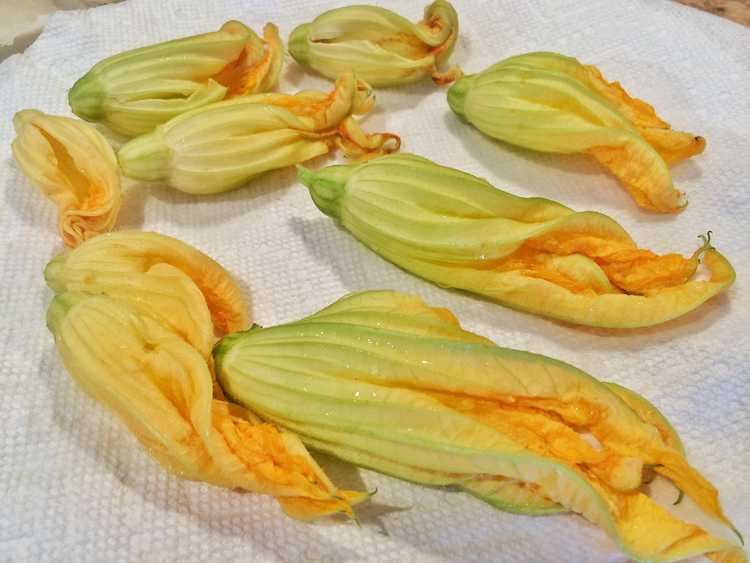 Zucchini blossoms are almost always served stuffed, battered and fried. Of course, these are my favorite way of eating them! I’ve been stuffing them with a combination of ricotta, parmesan cheese and basil, dipping them in a soda water batter and frying them all summer long. My family has been devouring them. But I decided, enough with the frying, let’s get back to some healthier cooking! Honestly, I think the best recipes are the ones that are improvised. 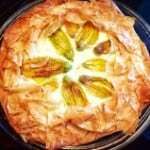 On this particular day I had a bunch of zucchini blossoms, a few leftover sheets of filo dough from when I made my spanakopita, ricotta and some eggs in my refrigerator. The entire recipe came together in no time. I’m using the same ingredients that I would normally use when I stuff and fry them but in the form of a tart. 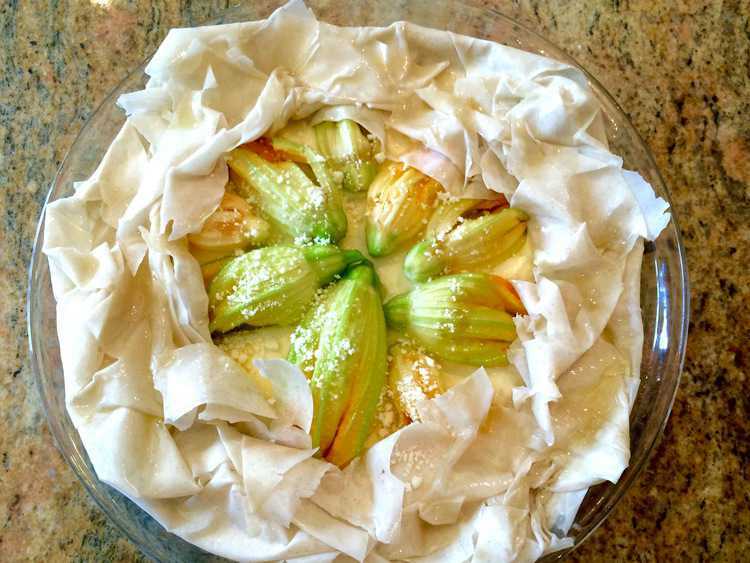 With layers of buttery, crisp filo dough enveloping the zucchini blossoms you really can’t miss the fried ones! Once again, the toughest food critics in the world (my kids!) gave this dish two thumbs up and so I had to share it with you today. We enjoyed this dish for dinner but it would make a great brunch dish. Another successful garden to table meal. Enjoy! This recipe is my alternative to traditional stuffed and fried zucchini blossoms. The same ingredients are combined in the form of a tart with a filo dough base to make this crisp, buttery tart. Unroll the sheets of filo dough on a flat surface and cover with a damp cloth to prevent them from drying out. Layer a sheet of filo on a 10 inch pie plate and brush with the melted butter. The edges of the dough will hang over the sides of the pie plate. Rotate the pie plate 90 degrees and place another sheet of filo dough over the first sheet. Brush with melted butter. Continue rotating the pie plate and adding the remaining sheets of filo, brushing each with the melted butter. Sauté the diced onion in olive oil until golden. Preheat oven to 350F. In a small bowl combine the onion, ricotta, eggs, milk, parmesan cheese, basil and salt and pepper, to taste. Pour the mixture into the pie plate. 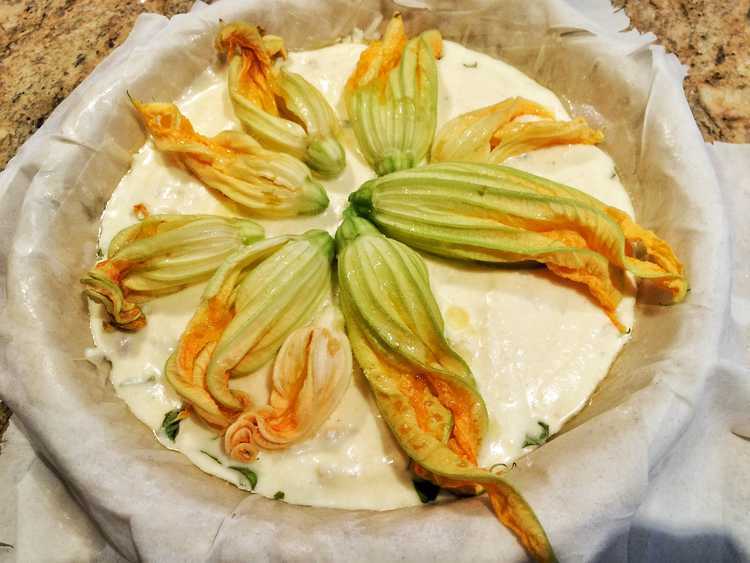 Place the zucchini blossoms over the ricotta mixture. Fold the edges of the filo dough over the filling and brush with the remaining melted butter. Bake for 30 minutes until the center has set and the filo is golden brown. Serve hot. Nadia! This looks and sounds incredible!! I wish I could find the blossoms local. My Aunt made them in Italy, but I've never seen them in a tart...wonderful idea!! Thanks so much! Although I've got plenty of them in my garden, the local farmer's markets also sell zucchini blossoms. I hope you find some! Thank you, Nadia! Yours truly look amazing...the ricotta filling really got me craving them! Gorgeous pics & post!